Its generally "love at first" sight for the growing multitude of holidaymakers now discovering the alluring charm of Wombarra Blue which beautifully combines the warmth of yesteryear with its many modern day comforts creating an unforgettable holiday atmosphere! 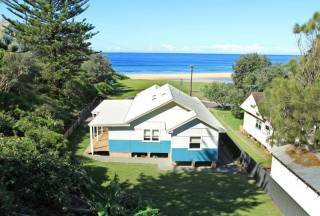 Showcasing breathtaking ocean views Wombarra Blue is perched on the desired beach side of the road with the sand only a 3 minute stroll from the back door. A playing field and playground for toddlers is even closer. Guests regularly comment on the healing sounds of the rhythmic waves at night and the chance sighting of whales and dolphins in the day that seem to build on the experience of relaxation here. Wombarra Beach is a unique village which offers the best of both worlds; it is nestled adjacent to the Northern Illawarra escarpment but is also situated adjacent to magnificent patrolled surfing beaches and rock pools of family discovery. 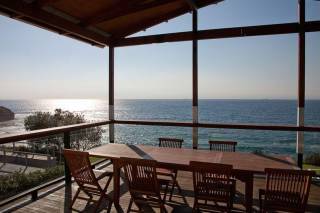 Wombarra Blue is ideally located providing the guest a wonderful Coastal Lifestyle experience. 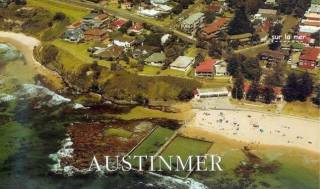 One would think you are days from Sydney rather than only an hour from its southern suburbs! There are four mainly large sized Bedrooms with beautifully appointed furniture, high comfort mattresses and an interior ambience designed for premium guest satisfaction. The House sleeps a maximum of 10 guests with two bathrooms and 3 toilets. You can even relax in a bath so designed to soak in the ocean view! Both Queen Bedrooms have TV and added DVD players to enjoy the movie library on offer. The privately positioned Master bedroom is perched high with it's own private balcony with views to die for! All bed linen and towels are provided for your convenience. Two separate living rooms upstairs and one downstairs with large surround sound TV/DVD means that there is a place for everyone to relax and enjoy down time whilst on holidays. This property is also fully zoned with air conditioning, the option of ceiling fans throughout and a cosy central gas fireplace for any cooler nights. Add to this a beautifully appointed Caesarstone Kitchen with all the modern conveniences of cooktop, oven, microwave, coffee machine, sandwich grill, dishwasher and fridge freezer with ice and water dispenser at your beck and call. The open plan design lets you mingle with your fellow guests and family whether they be in the dining or living areas. The tiled panoramic ocean balcony becomes a favourite meeting spot to read, sunbake or entertain with the large BBQ and an outdoor dining table seating 8 comfortably in a part sheltered design. What's a view like this without your favourite music streaming from your Bluetooth Music library through an amazing Sound System both indoors and on the balcony? Wi-Fi is also available if you care to connect with the outside world. Coledale, Austinmer and Thirroul Villages are only a short drive away for restaurants, entertainment and quality retail outlets including everything from boutique shops to, organic stockists, butchers, banks,supermarkets and pubs and clubs. The infamous Scarborough Hotel is a short few minutes stroll away while you are also in close proximity to the world renowned Seacliff Bridge and the Royal National Park with all its hidden beach discoveries. Wombarra Blue is simply gorgeous and likely to capture your heart again and again! A true holiday "home away from home". 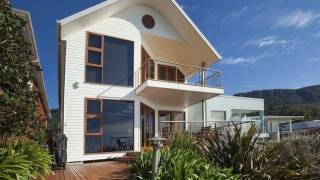 A Coastal Retreat in a paradise without all the driving! Book early for this one! 4 Bedrooms, sleeps a maximum of 10. Accepted bookings will be confirmed by return to the Agent of this Agreement signed by the Guest. The Agent will accept this Agreement only after the Guest has accepted the terms and conditions, signed the Agreement, paid the required 25% deposit to secure the booking and provided suitable identification (e.g. driver’s license copy Until then, bookings are requests and not confirmed. Deposits are non refundable – please choose your dates carefully. Bookings can be cancelled where more than 60 days notice of cancellation is given and no further amounts owing will be payable, however the deposit will be forfeited.). Balance of tariff plus security bond is to be paid in full 60 days prior to the booking date and after this point, should you elect to cancel – no refund will be given, unless the dates are re-booked. Refunds will only be given in these circumstances after the date of the booking has passed.$75 Administration fee will apply to any amendments to your booking. The Premises are let for holiday purposes only for the period, at the Rent and for the number of Guests stated in the Letter of Confirmation. MAXIMUM 10 guests 4 BEDROOM CONFIGURATION. Additional guests of the Guests are not permitted without written consent given by the Managing Agent. Subject to Approved Applicants - #Security Bond Payment. Payment of the required $1,000 security bond can be deferred by processing an initial credit card payment of $1 on condition that a claim for the cost of repair or replacement for loss or damage to the property resulting from your stay will be, subject to the following, paid by a further credit card payment up to a maximum of $1,000. Such claim will be made after vacation of the property when an inspection will be conducted. If there are any issues regarding loss or damage you will be contacted and advised of the cost of replacement/repair.If there are no issues regarding loss or damage the $1000 security bond is refundable, however the $1 is not refundable to your credit card. No parties are to be held at the premises including but not limited to Bucks parties and Hens nights or any other party, gathering or celebration. Those who hold a party without will be evicted from the property without refund. The Premises and its contents are to be left in good order and condition. Legal recovery action for reinstatement costs will take place if the Premises or its contents are not vacated in original condition – fair wear excepted. Keys will be available only after ALL monies have been paid in full. Key collection is as arranged with the Agent who will normally meet the Guest on arrival at the Premises. Return of keys is as arranged with the Agent. 2 sets of keys will be issued and if lost will be billed to the Guest at $45 per set. Payment of Rent in advance can be made by EFTPOS direct deposit or by credit card. Acceptable credit cards are Visa and MasterCard which incur 1% fee and American Express which incurs 2% fee. If rent payment is made on arrival only cash is acceptable. No refund will be given after payment is made if the Guest has to leave earlier than expected. The Guests are to vacate the property strictly no later than 10am on the day of departure unless late checkout is previously arranged. All bookings are made in good faith but may be subject to change at short notice. Should changes be made, neither the Agent nor the Owners shall be responsible for more than a refund of monies paid. The Guest will take all reasonable care of the premises and promptly report to the agent any malfunctions, damages and losses. The Guest will pay to the Agent all costs incurred by the Agent, caused by the Guest’s occupancy of the premises including repairs, replacements, interruptions to connected services including excess garbage removal. The Agent shall be entitled to recover such costs from any deposits or bonds held by the Agent (where applicable) or take action to recover these costs, but without limiting the liability of the Guest. Property descriptions are made in good faith. No responsibility can be accepted for errors, omissions or miss-descriptions. No refund will be given if bookings are made from internet descriptions. All sales are final. The Guest will permit the Agent and persons authorized by the Agent to enter the Premises during the rental Period for the purpose of necessary repairs, investigations of complaints or inspection by prospective Guests and the Agent will give due regard to the Guests right to quiet enjoyment. The Agent reserves the right to cancel any bookings. The Agent and Owners will not be held responsible for any noise from nearby construction sites, businesses or the like. The Guest shall not cause nuisance to neighbours and will comply with any statutory laws, by-laws and regulation applicable to the Premises. Neither the Agent nor the Owners are responsible for the Guests effects kept or left on the premises. The Guests will not under any circumstances keep any animals or pets on the premises unless written permission has been given by the Agent. For health and safety and the comfort of other Guests smoking is not allowed inside the Premises. Stiletto type heels are not to be worn inside the Premises because the polished timber floors may be damaged by such heels. Cost of repair to floors by Guests using Stiletto heels including replacement of floor boards, sanding and polishing the floor, will be recovered from the Guest. The Agent will check inventories but is not obliged to do so on the arrival or departure of Guests. The Agent may check inventories with the Guest at the Agents option. Failure to observe these terms and conditions will result in termination of the its booking or an amended charge.